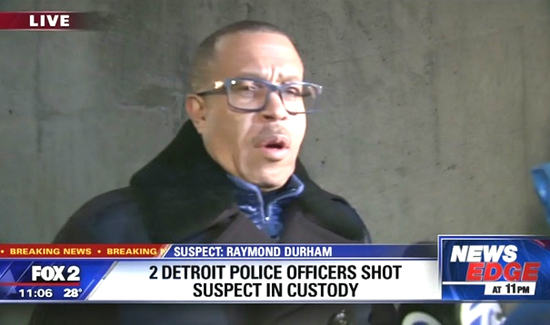 Detroit police have arrested a man suspected of shooting two police officers Wednesday night. The suspect, Raymond Durham, was arrested in the area of Michigan and Vinewood at 11 p.m. The 60-year-old is suspected of shooting two officers at 8:15 p.m. in the area of Ash and Tillmon on the city’s west side. The officers were conducting a narcotics investigation when they approached a man who was “acting fidgety,” Police Chief James Craig said. The man pulled out a gun and fired before the officers returned fire, Craig said. One officer was shot in the neck but is expected to recover. The second officer was hit twice in the upper torso and was saved by a protective vest. He was also shot in the ankle, but the wound is not considered life threatening, Craig said. A gun was recovered during Durham’s arrest. Durham also had been shot in the leg and was taken to the hospital. Chief Craig says he believes that injury was sustained during the shootout with officers. The officers who were injured are from the Third Precinct. One has been with the department for 20 years and the other for 4 years. The shooting took place near where Wayne State University officer was fatally shot in November. The officers who were shot Wednesday were part of a stepped up police presence in the area since 29-year-old Collin Rose was shot, Craig said. Police are investigating whether there’s any connection between the shootings in November and Wednesday, Craig said. Investigators have been asking for tips from the public in Rose’s death. Charges against a man initially arrested in the case were later dropped.